Editorial Note: Historically, when the People's Republic of China was proclaimed by the communist factions, the nationalist China Republic took residence in Taiwan beginning in 1949. The following changes are reflected by Grossen Flaggenbuch  1939-1941 and Flags of All Nations 1955 . Confirmed by Ivan Sache and Jaume Ollé in their messages. The Chinese Nationalist gained control of the Government and some flag changes were adopted. These included slight modifications of the Rank Flags and a replacement of the quinta-color national flag which meant a change in the Jack. The former naval ensign was up-graded to the National Flag and the canton or [KMT Flag] was chosen to replace the quinta-color Jack. With out proper verification, I can only say that I have been told that these same rank flags are still in use by the now titled Republic of China [Taiwan]. When Kuomintang (Nationalist) forces, which favoured the "Blue Sky, White Sun, Whole Field Red" design, defeated the warlords and unified China in 1928, this flag (which remained the naval ensign) became the national flag on land, and the canton of this flag became the naval jack, in both cases replacing the five-striped design. Crampton's The Flags of the World  has five pictures of pre-revolutionary Chinese flags taken from a collection of cigarette cards. He stated that the flags were used in pre-revolution China and are still in use. The 1995 recapitulative issue of the 1990 Album des pavillons nationaux et des marques distinctives des états et des principales organisations internationales  lists these flags for Taiwan (different from Album 2000 ) and shown in Flaggenbuch . 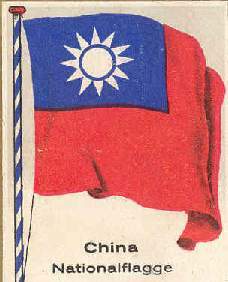 After the civil war ended in 1928 the Nationalist army continued to use the Army flag and the Army Officers' College flag, at first in mainland China, then in Taiwan, to this very day. In addition, generals of Chiang's army had their own flags, their designs varied according to the taste of individual general. Generally these were blue flags, often 'double flags' with a small flag above a larger one. Apart from the mandatory white sun, these flags featured a variety of Chinese words - title of office, the word 'command', even the general's surname - a feature thought to be characteristic of generals' flags in ancient China. You will notice that the flag (shown in the album Die Welt in Bildern Album 7 has a blue and white flag-pole. That's strange because all the other flags in the album are depicted with brownish, i.e. wooden in natural colour, flag-poles. Source: Die Welt in Bildern Album 7: Flaggen der Welt, aussereuropäische Staaten, edited between 1928 and 1932 according to the international boundaries in the included map of the world. The flag is depicted in on p.3, image no.215. Surprisingly, the Republic of China (ROC) National Flag and Emblem Act of 1928 did not mention the colour of the flagpole (other than a red ball finial, which understandably was almost universally ignored, but the ROC National Flag and Emblem Act of 1954 did specify a white flagpole with golden-yellow ball finial. 6 Flags of the World. The contributor did not cite an edition, but likely either Barraclough and Crampton 1978 (FOTW bibliographic code [c2b78], or Barraclough and Crampton 1981 (FOTW bibliographic code [c2b81].